Displays of premium optical quality, sunlight readability, and fast, reliable manufacturing methods are a must. Call us today at 800.952.2535 to improve your display performance. 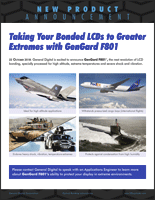 General Digital is excited to announce GenGard F801™, the next revolution of LCD bonding, specially processed for high altitude, extreme temperatures and severe shock and vibration. Download our Product Announcement and Data Sheet now, or watch the video. Additionally, look over the Enhanced Displays Line-Up Sheet for our offering of LCDs enhanced with high brightness, NVG compatibility, extended operating temperature range and more. Film Laminations All types of displays suffer visibility problems when exposed to uncontrollable high ambient lighting conditions. Optical Bonding Laboratories can easily, and passively, compensate for this problem by applying a variety of film laminations. | Brightness Enhancements As more and more displays find their way into outdoor and other high ambient lighting environments, their brightness output must be at a level most off-the-shelf displays can't achieve. Optical Bonding Laboratories offers several effective solutions. | Optical Bonding Optical bonding–affixing two optical elements to one another using a liquid adhesive–improves a display’s optical performance, and its resistance to shock, vibration and moisture. For over a decade, Optical Bonding Laboratories has expertly bonded thousands of displays. Now, we’re ready to take on your project. General Digital’s rugged monitors are built in the U.S.A. for a varied array of real world environments.